Two weeks ago, we thought about all the things that we love about St. Catherine’s and what we need to do to make those things happen: as well as people to help out with the many things we do at St Catherine’s, we also quite simply need money. Last Sunday, we talked briefly about what levels of funding we need to run St. Catherine’s. Nearly 60% of our budget is needed to fund our Vicar’s salary and all the contributions which we, as employers, need to pay. Another 17% is needed to pay for our buildings and of that, 70% is rent for the Anglican Centre and 14% is electricity and gas for the centre. We pay only a very small contribution towards the costs of running the actual Church building, which is mostly funded by our Old Catholic friends. The next biggest item in our budget, currently around 7%, is our contribution towards the cost of running the diocese. So just 3 items make up more than 80% of the total costs. Apart from our outreach contributions, the remainder goes to things like administration, travel, buying candles and wafers, copying, music, Christian education (e.g. Sunday school)… We are really a pretty lean organisation with some big, non-changeable fixed costs. So where does our funding come from? Around 60% of it comes from regular or one-off donations which are mostly planned and pledged. This is the best kind of donation for the Church as it is regular and reliable! The Sunday collections, which can vary immensely, amount to around 30% of total income, about 8% comes from fundraising activities. Unfortunately, our income is less than we spend at the moment! We don’t get any money from the German government or Church tax system or from the UK, USA or Anglican or Episcopalian Churches. It’s up to us to pull together the funding we need, by helping to organize fundraisers, working on the council to guide the Church, taking on other tasks to ensure we keep our costs down as far as we can or indeed by making monetary donations as we are able. It is up to each of us to consider in our hearts what we can contribute to help St. Catherine’s to thrive. Planning our budget is easier if we can rely on regular income. So pledges and regular donations (e.g. by standing order) are very helpful. We can provide German tax receipts for donations which are clearly traceable to you (e.g. by bank transfer or by putting a donation in a named envelope) as long as we have your postal address. If you would like to make a pledge, you can use this Stewardship pledge form 2018, which also provides you with the Church’s bank details if you would like to make a bank transfer or set up a standing order. 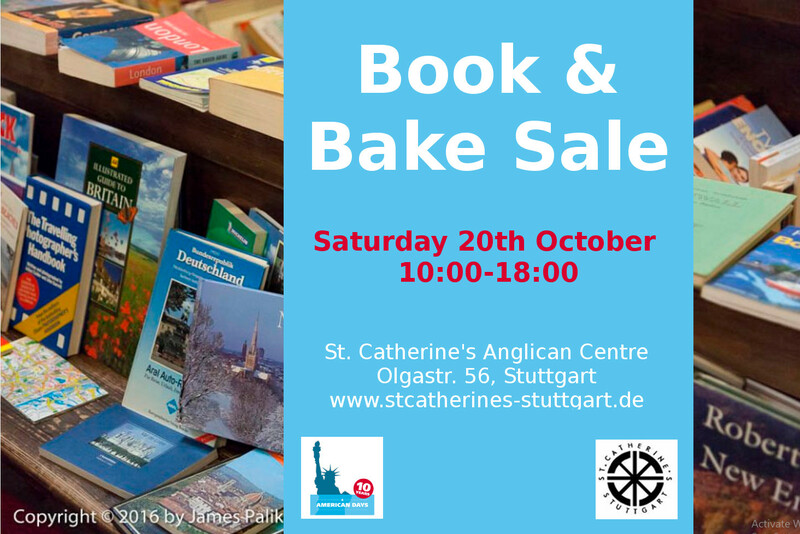 Helpers needed … for the Book and Bake Sale – please speak to Susanna or Naomi. Though my calling belies this – my ‘natural habitat’ is at the periphery not not not anywhere near the centre….. and yet big or round birthdays project us to the centre. I did manage to avoid a party and had instead a number of quieter events with my two orphans and a very few of my friends in England. Every new decade I set myself to some reflection, out of which usually emerges a new skill I want to learn and a new focus for my character building / spiritual fruit growing. So in the last decade I learnt a lot about Labyrinths as a symbol for the journey of faith/ of the spirit and of life and managed a week before that decade closed, to walk the world’s most famous labyrinth – the one in Chartres Cathedral. My key word was generosity – of spirit, of thought, of action….. as well as to notice it in others. So for this decade – we shall see what emerges. I will keep you posted. Shot off, as I did, right after our Schulanfang service and church picnic I am mindful that people were not thanked. Andrew and Anja who led our music (and perhaps we will see more of them on sundays when Stephen can’t be with us), Marianne and the many children who helped lead our worship, and many others who do what they do with commitment and generosity – Thank You. Thank you too to our Finance Team in the shape of Jackie and Susanna who help us all to navigate that part of our discipleship with greater focus. Thank you too at the start of a new academic year to our team of Sunday school teachers who are spending two terms on the Eucharist Service so that the many children who receive communion as baptised members, do so with a level of understanding appropriate to their age. This entry was posted in Bible Study, Chaplain's Musings, Message from our Bishop, News from the Diocese, Notices. Bookmark the permalink.